After I wrote that blog about Spirit Mountain, and the two yapping, howling dogs and the shamanic overtones, I remembered one of my favourite old jokes, and one of my favourite old T-shirts. In an old heritage building in Adelaide, where I used to visit because Perpetual Trustees once had its offices there, the basement was inexplicably occupied by a bar and micro-brewery which made and served what it claimed to be Australia’s first alcoholic lemonade, bearing the name “Two Dogs”. Which I of course found highly amusing. 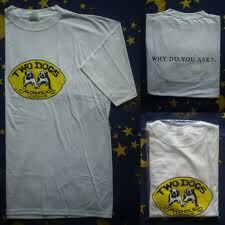 That was my second favourite T-shirt ever, after the one that said “Try to never split an infinitive”.